You may have come across the term Hearts and Arrows or H&A before but do you know what it actually means? 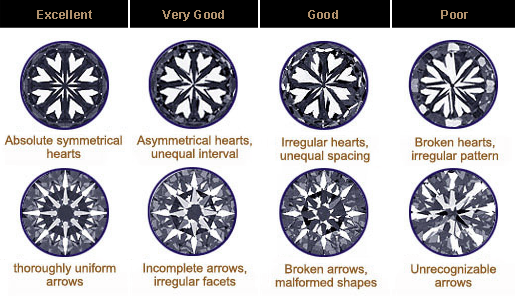 In basic terms, when viewing a diamond from its crown (the top) you should see a formation pattern which shows 8 symmetrical arrows. When the diamond is viewed from the pavilion (the base) 8 hearts should be apparent. Unlike clarity and color, the H&A system is a man-made influence and is in regards to how the stone has been cut and polished. Perfectly symmetrical Hearts and Arrows will command a premium price and are of the highest quality due to the craftsmanship that has gone into creating them and the fire and brilliance which is omitted from them. There are very few companies that offer true H&A diamonds, many will market themselves as having them but few are able to back up their claims with data. It is for this reason that it is important that you know what you are looking for in Hearts and Arrows diamond. In the 1970’s a tool called the Firescope (sometimes called a H&A viewer) was developed by a gemologist named Kazumi Okuda which allowed directed light to reflect off a diamond to view the internal structure of it. The idea of the tool is to reflect light onto a diamond under strict viewing conditions, using different colored light set at specific angles to provide an image which should, ideally, display a Hearts and Arrows pattern. It is a simple tool which has changed little from its first creation. The Hearts and Arrows pattern was originally viewed by accident by Kinsaku Yamashita, becoming trademarked in 1988. By the early 1990’s, the Hearts and Arrows phenomenon had quickly spread from Japan to America and became the house-hold name that we associate with Super Ideal cut diamonds today. A diamond should have 8 arrows and 8 hearts – If there aren’t 8 of each, it is not a Hearts and Arrows diamond. Symmetry – Each shape should be symmetrical and in turn the symmetry should reflect like a mirror to those opposite it. It is important to not mix Optical symmetry up with symmetry in a GIA certificate – although running on the same concept, they are 2 different entities. Size – Each Heart and Arrow should be the same size across the whole diamond. Uniform shape – Hearts should look like hearts and arrows should look like arrows with a uniformed shape across every aspect. Equal spacing – Each shape should be equally spaced from its neighbor and in turn equally spaced from the shapes opposite to it. Fitting – Arrows must fit into the gap between hearts with the base of the heart fitting into the V of the arrow. Coloration – Hearts should be one color and not of a two-tone effect, however, this is a minor influential feature. How are H&A diamonds graded? In short, they are not graded. Neither the GIA nor the AGSL take into consideration the H&A cut of a diamond and as such, one which is has been graded Ideal Cut may not be a true H&A diamond, even though it may have been graded ‘Excellent’ for symmetry. The same can be true for a specific H&A cut diamond, it may show a true H&A symmetrical pattern, fulfilling all of the criteria as discussed above but it may not be an Ideal Cut diamond. Only diamonds with a certified Ideal Cut and showing a true Hearts and Arrows pattern can be called Super Ideal Cut. There is currently no industry standardization for H&A diamonds as yet and only an ASGL Platinum certificate will show an ASET image of the Hearts and Arrows pattern. Why are H&A diamonds more expensive? 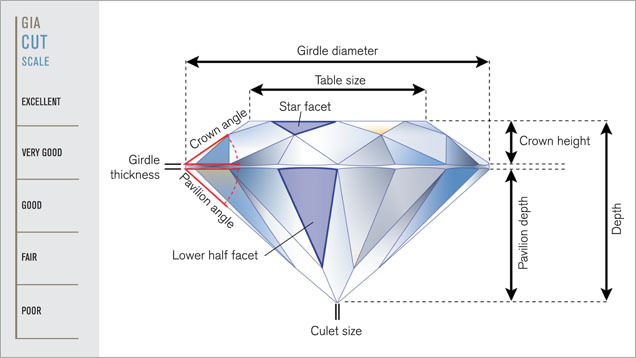 The image above shows the relation of the facets to one another and thus how difficult it can be to achieve a H&A diamond. Perfect H&A are difficult to create to absolute perfection and it is estimated that even the top 0.1% of round brilliant cut diamonds will show some form of minor defects from the perfect H&A patterning. Minor deviations are acceptable but only as long as the integrity of the patterning remains in place. Why choose a Hearts and Arrows Diamond? The way in which a H&A diamond has been cut dictates the fire in which it can emit. Although an Ideal Cut diamond may offer perfect symmetry it may not offer the same light reflection as one which has H&A symmetry. It should be noted that optical symmetry as seen in a H&A diamond is different to the ‘symmetry’ that is viewed on an AGS or GIA certificate, even a diamond that has been graded as ‘excellent’ may not have excellent optical symmetry. A H&A diamond will have robust light return, offering sparkle in even dull viewing conditions with little light. It goes without saying that the reason most bricks and mortar stores have bright, artificial lighting is to emulate light return when it may not be present. A H&A diamond will always sparkle and emit fire under softer light. It is vitally important that the diamond you are buying is what the company says it is. As we have covered, some companies may market their diamonds as Hearts and Arrows when they are not, so it is important that you, as the customer know what you are looking for. Whiteflash is one company who readily make their information available to customers, it is this sort of openness that is needed for customers to make an informed choice about what they are buying – The company has received great reviews for their A CUT ABOVE® Hearts and Arrows Diamonds for not only the diamonds themselves but also the transparency of information available to customers. You can read the review here. I would also recommend considering James Allen with their True Hearts Line.